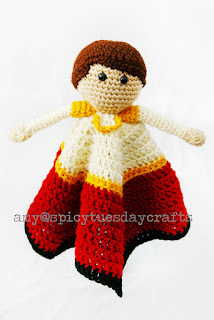 spicy tuesday crafts: Princes...because every Princess needs a hero! So, after a ridiculously long time since my last post, I'm finally here again with some more FREE notes! Don't get me wrong...I haven't just been sitting around. I have published many of my Blanket Buddy patterns on Ravelry (come by and check them out here ) and my hooks have been smokin' with all the items I've been making. But over the holidays I had a sudden inspiration...Princesses like to play with Princes! So I set to work coming up with a super easy prince base pattern that could be easily customized to represent the Prince of your dreams. Lots of trial and error...and gallons of coffee later...I give you my Crown Prince Blanket Buddy. He is fully customizable and I included optional items such as a cape and a crown. He's ready to follow his Princess on all their adventures! I also came up with five versions of my Prince to go with five of the Princesses that I have posted before. 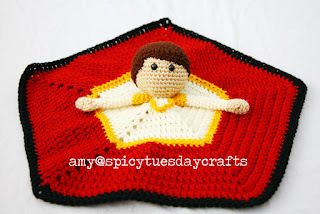 Each day this week I'll post FREE notes on how to turn my Crown Prince Blanket Buddy pattern into a different prince...Prince Charming, Prince Ferdinand, Sultan Aladdin, Prince Eric, and Prince Phillip. Now, these FREE notes won't make much sense without the Base Pattern...actually they won't make ANY sense at all!...so swing by my Ravelry shop to get your copy (you can get it here...thank you!!). Then come back each day this week to collect your notes and get started working up your collection! And as always, I'm around to help if you need me. The best way to reach me is my Facebook page...send me a message anytime! Oh, and I made these princes for my own collection. You probably shouldn't make them to sell or the Big Name Company will get upset. Blanket -- With Aran, work R1 through R7 as written. Switch to Gold, work R8 as written. Switch to Cardinal, work R9 through R15 as written. Switch to Black, work R16 as written. R19 - 1sc in ea st around (12 sts). FO. Hair -- With Chocolate, work Wig Cap as written to R11. R12 - 1hdc in next st, 1dc in next 5 sts, 1hdc in next st, 1sc in next 3 sts, turn, 1sc in next 10 sts, sl st in next 2 sts, 1hdc in next, 1dc in next 5 sts, 1hdc in next 2 sts, 1sc around to the "turn." FO leaving a long tail to sew Wig Cap to the Head. Gold Chain -- With Gold, Ch11 and FO. Sew to each sleeve cap (see photos for reference) and tack down to Blanket on Chain #6.